Joe, Ling. ; Joe, Mary. ; Shanghai Cafe (Tulare, Calif.); Restaurants -- California -- Tulare. 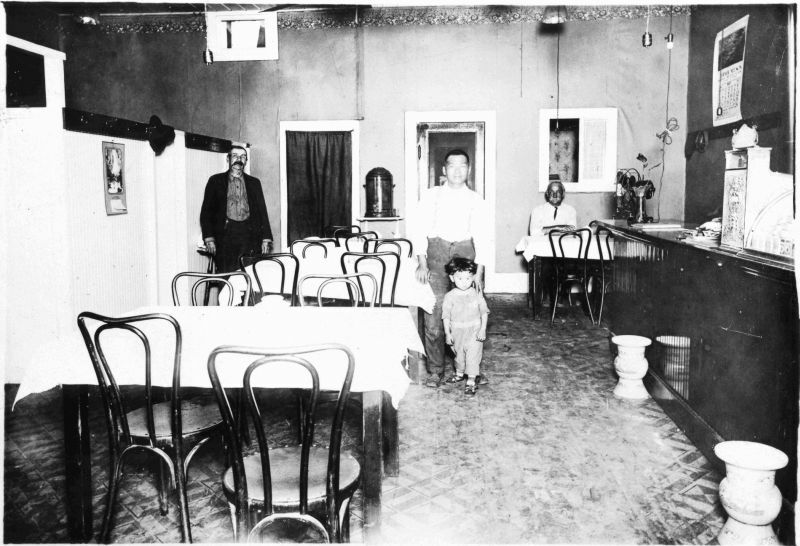 The Shanghai Cafe, 243 South "K" Street in Tulare, California, was owned and operated by Ling and Mary Joe from 1914 to 1925. This image is being made available for educational and research purposes only, under the ?fair use? clause of the U.S. Copyright Law (Title 17 ? 107 U.S.C.) Further questions regarding the image or its use may be directed to the Tulare County Library, 200 W. Oak Ave., Visalia, CA 93291; Phn: 559-733-6954; Fax: 559-737-4586. “Shanghai Cafe, Tulare, California,” San Joaquin Valley Library System Digital Collections, accessed April 18, 2019, http://digital.sjvls.org/document/3887.